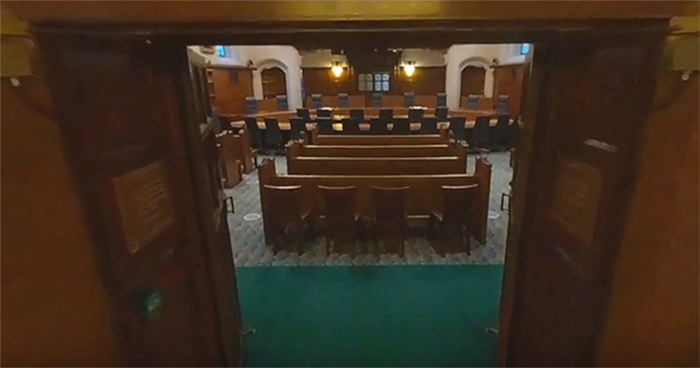 You can now take a tour of the UK’s top court from the comfort of your own sofa thanks to a new interactive 360 degree video. The clip, produced by tech wizards over at the BBC, allows members of the public to glide through the Supreme Court’s corridors and courtrooms, while at the same time discovering more about its role in the UK legal system. In addition to this, and thanks to some clever camera trickery, viewers can use their computer cursor (or finger if using a mobile device) to look around the historic Westminster building as if they were actually there in person. The tour starts with viewers being led through the court’s security guard-laden main entrance (no sip test required) and up a sweeping staircase into courtroom one. The grand courtroom, which can accommodate all 12 justices, has been the setting for a number of high-profile rulings in recent years including the Brexit-related Article 50 case. Other tour highlights include the court’s stunning triple-height library and fact-filled exhibition centre. The Supreme Court is just one of a number of eye-catching buildings to open its doors to the BBC’s special camera equipment. You can also have a nosey round Buckingham Palace or take in the grandeur of St Paul’s Cathedral, again all from the comfort of your sofa. The video’s release comes just weeks after the Supreme Court launched a new summer school featuring a programme of interactive workshops, tours and, perhaps most importantly, the opportunity to dress up as a justice. The summer sessions are suitable for both adults and children, and will operate on a first-come, first-served basis. The next sessions are scheduled to take place later this month. If you can’t wait until then, the building is open weekdays from 9:30am to 4:30pm and entry is free. The post You can now explore the Supreme Court using a new interactive 360 degree video appeared first on Legal Cheek.